What made us crazy enough to take on two major renovation projects at once?! Well, I really do know the answer already. There are less than three months left before baby girl arrives and progress comes to a halt, and the projects are linked- we really couldn’t start one before setting the ball rolling on the others. So, while I’m also decorating for Halloween, there is a lot of demo and construction going on behind the scenes. I had to wipe quite a lot of construction dust away before photographing my Halloween Vignette last week. Any given evening can find us removing wallpaper and hanging drywall, mudding and taping (which we loathe), etc. Each space is really starting to take shape, so I knew it was time for an update! Remember the dark wallpaper? The wallpaper is now about 90% removed- the remaining wallpaper will have to wait until will build the new floor and cover the old stairway before we can reach it. A tutorial on wallpaper removal will be coming your way soon! It is truly a brutal job, but hopefully you can learn from our trial and error. We also framed in the new doorway and installed the new door. Without the dark wallpaper, we were amazed by how sunny and bright the room is! 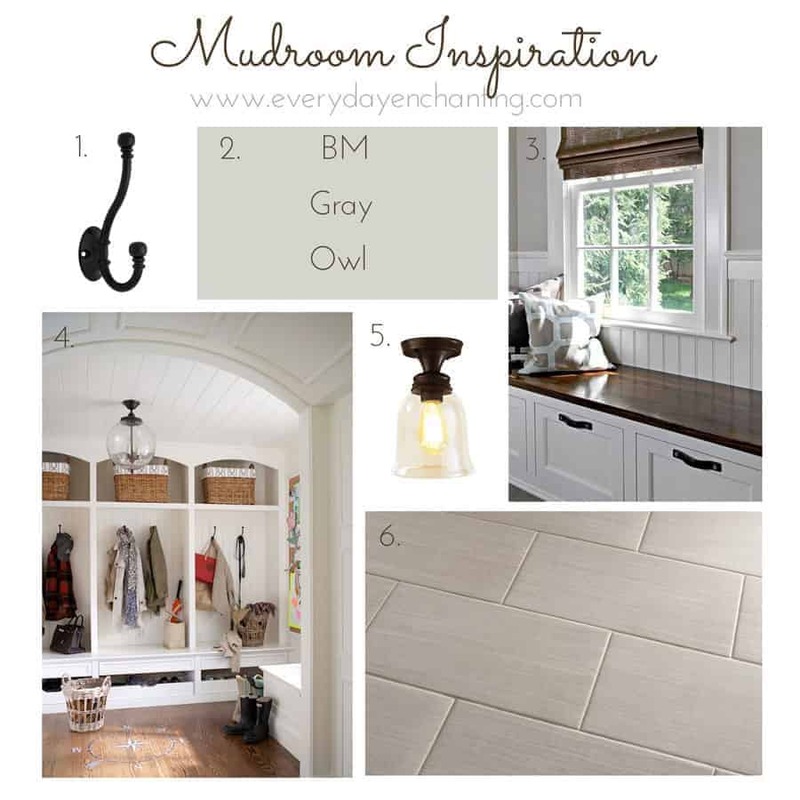 I plan on painting it BM Wickham Gray, the same changeable gray/blue/green color as the Powder Room. It is such a soothing color, and I think it will go perfectly in the space! 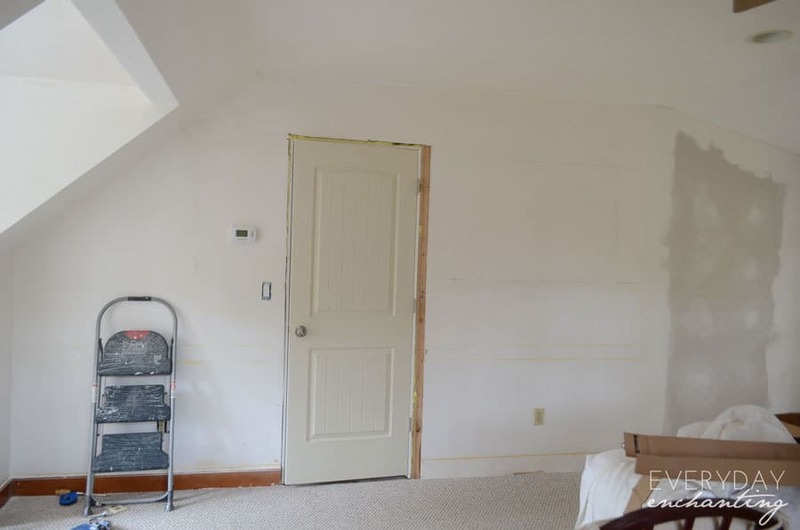 We are currently filling in all of the nail holes from the orange/brown chair rail we removed, and then we have to sand and prime the whole room, because the wallpaper removal did do some damage. You may remember that we also carved out a space for the laundry room. It is now an actual room! 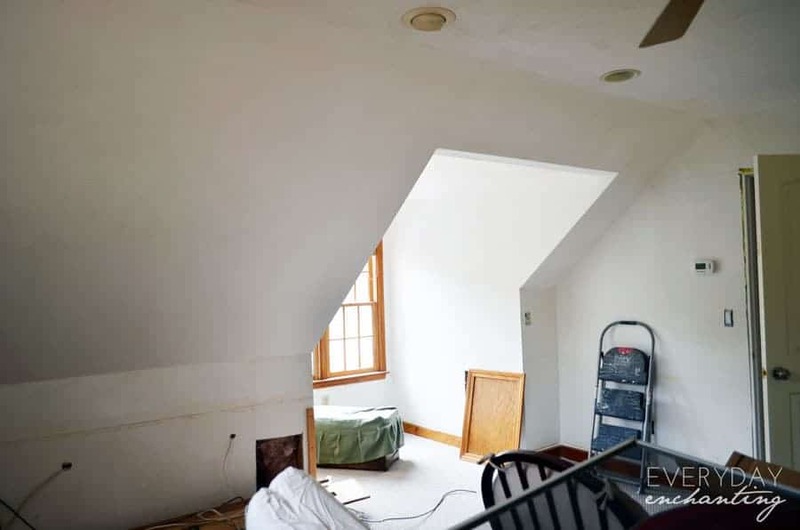 We are currently in the process of finishing the walls, which still have some wallpaper that needs to be removed- and of course, lots of mudding, taping and sanding. We have a pocket door waiting to be painted and installed (it’s actually framed in, we just have to add the hardware and put it in place). We are actually going to pause that particular project at this point for now, as it’s functional- but eventually we will be adding flooring, cabinetry, a countertop, and clothes storage to the opposite wall. For now it will just be the washer/dryer, our rickety clothes hamper, and the reused clothes hanging bar and shelf combo from the old closet. Like every room in this house, we have to turn it into an actual, normal (non-wallpapered) room before we can add the fun extras. Whenever we get to a point upstairs where we need to take a break, we begin working on the former laundry closet/ future mudroom again. So far we’ve ripped out the old textured drywall (and very fortunately discovered a potentially catastrophic leak in the wall before it could wreck the powder room. 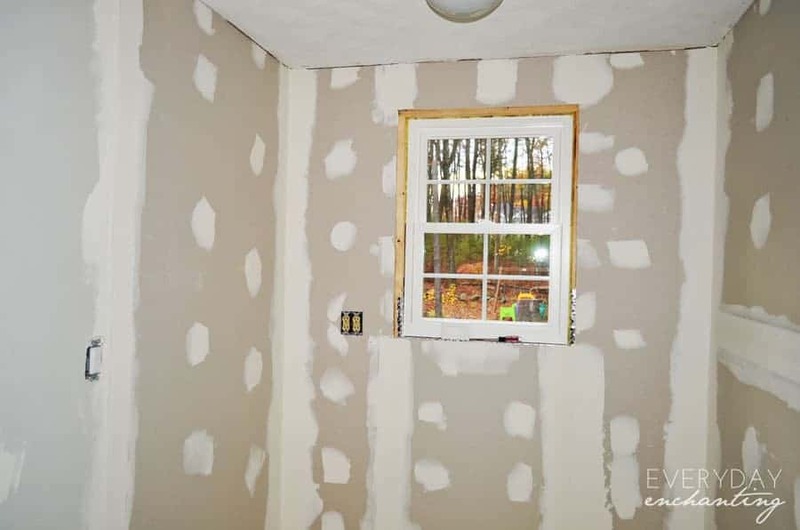 ), framed in and added a window, replaced the drywall, and began patching. Our next steps are to paint, add the beadboard 2/3 wall treatment, and then install the tile floor. Traditional Entry by Jasper Cabinets & Cabinetry MasterBrand Cabinets, Inc. Though Mack and I haven’t specifically discussed the design yet, the Mudroom will have some sort of locker/bench combo built-in. We actually kind of designed the pantry the same way, now that I think about it. Unfortunately space is somewhat limited, so there will probably be three narrow cubbies. 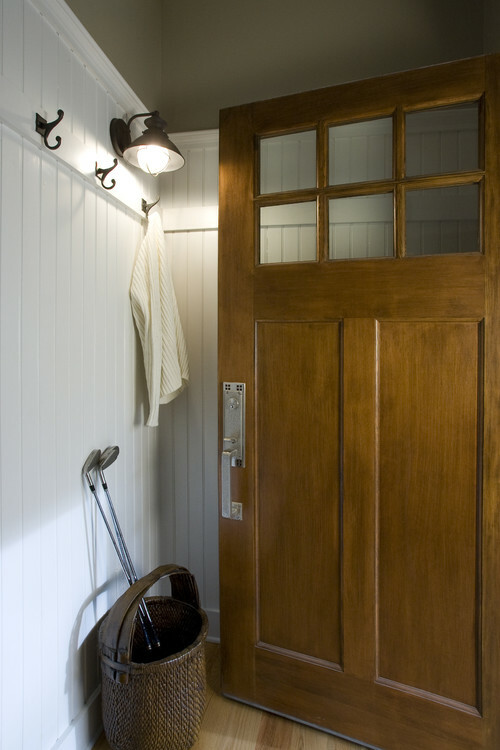 Since the mudroom walls and ceiling currently have the infamous seashell texture (if you have no idea what I’m talking about, you can see an example of it in the powder room ceiling post) we will definitely be covering that up with some sort of panelling rather than replacing a large portion of the drywall. 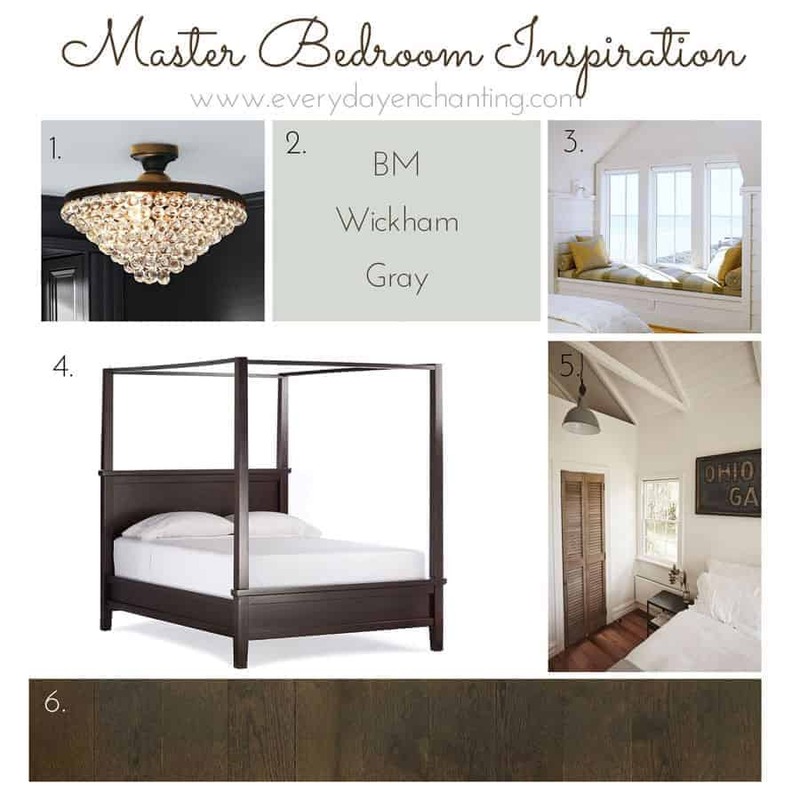 We have discussed both planked walls and floor-to-ceiling beadboard, but we haven’t come to a decision yet. I think both would be beautiful, so I will be happy either way! I am so incredibly excited to get started! Make sure to follow along on Instagram for real-time sneak peeks of the progress!